Early September saw the classifier visit Richaven again, with 35 animals inspected and eight going excellent for the first time, with two more cows scored at EX94. 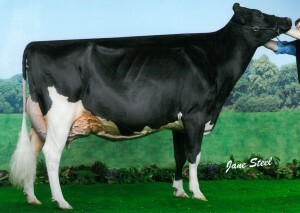 These were Richaven Rapture’s Rebecca and Richaven Goldwyn Dellia. Meanwhile, both Richaven Sanchez Squaw 2 and Crockers Winner Stocking achieved scores of Ex93, the maximum possible for third calvers. Alongside this all 11 heifers inspected scored VG. Once again the consistency in the herd has shown through with another tremendous day’s classifying. Among the heifers classified was our recently imported Belgian heifer, Arriva De Bois Seigneur, an Atwood daughter which is owned jointly with Heavenly Genetics.